Your New Money Mindset is a new way of thinking about the role money plays in our lives. Many of us live with ongoing, and often unexamined, tension related to money. Few of us have really escaped the credit-card trap or freed ourselves from worries about having enough for the future. 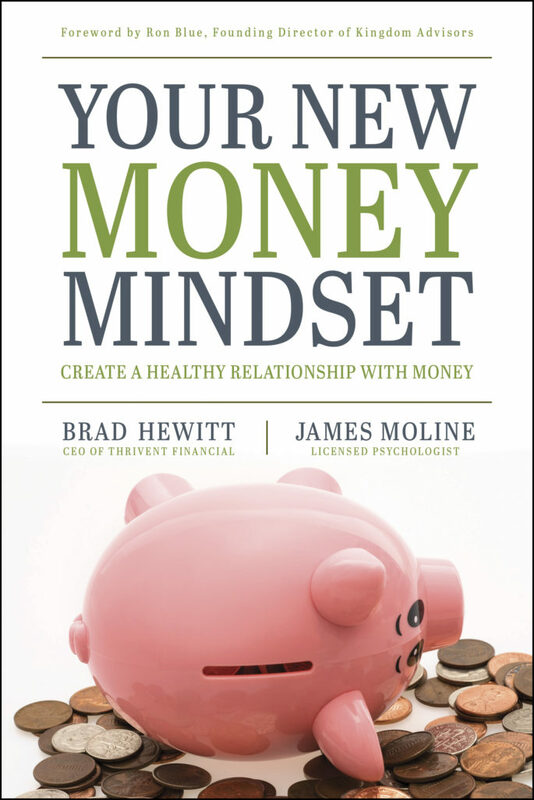 Co-authors Brad Hewitt, CEO of Thrivent Financial, and James Moline, licensed psychologist, believe we haven’t spent enough time examining our fundamental attitudes toward money and aligning those attitudes to our core values. Before you can remake your money habits, you need to start with your heart. In Your New Money Mindset, Brad and Jim guide you through the Money Mindset Assessment, which will help pinpoint what attitudes about money you could work on in order to develop an openhearted attitude to life. The goal is to cultivate a surplus mindset that allows you to enjoy what you already have and be generous toward others. Discover today how to free yourself from the money trap and create a healthy relationship with money. Note: Hewitt and Moline start off their book by helping us define this concept of a “Money relationship”. It is important that we realize what an impact money has on our lives. We need to start by understanding what it means for us to have a relationship with money. Then we can define or pinpoint where we are on that relationship scale, and determine where we would like to go. In other words, we all need a DTR (determine the relationship) with money. Note: This is a sobering thought- one that I had not deeply considered before this semester. Hewitt and Moline help us to realize that debt affects our relationship with the Lord, as it can stop us from being able to give and go generously. Note: This is really an expansion on the idea that was spoken about in chapter one. I have seen multiple examples of money hurting relationships and spiritual well-being. We need to recognize the incredibly real danger money has in depleting our trust in others and the Lord. Note: This is “the new money mindset” that Hewitt and Moline were talking about (21). The mindset is created, not by a change of circumstances, but by a decision. We are to decide that we have been given enough for ourselves and enough to be generous. This idea is contrary to the world, but it is a Biblical concept. Note: Peace does not equal perfection. What an important piece of wisdom we should all try to understand. No matter where we are in our money struggles, this chapter reminds us that we can have peace, if we decide to find contentment in what we have and, ultimately, in Christ. Note: I love this advice! Especially for us college students, we don’t always need to force ourselves to give money where we don’t have any (many college students don’t have jobs!) What we can do is give our time and our talents. In some ways, that is a harder sacrifice than money. It is a beautiful sacrifice, though, one that teaches us so much about the Lord and how to love others. Giving of time and talents is a way to put ourselves in a position where we are always able to give generously. Note: Hewitt and Moline remind us not to see our “longing for security” as something evil. It is good to want security, good, and prosperity. What is wrong is when those desires become more important than anything else in your life- more important than generous giving, more important than the Lord and his will. Note: These were the most practical tips of the chapter. Hewitt and Moline give us five practical steps we can take to help make sure we are working toward financial stability, but still keeping a Christ-centered worldview. They are quick to remind us that, contrary to what society tells us, giving is actually beneficial to us for stability, peace, and wisdom. Note: Hewitt and Moline write about how fear can shackle us. We can become so afraid of money that we hoard, or worry too much about every decision. While it is good to be careful, we should not become so afraid of money. If we are struggling with this fear and anxiety, this verse is a great help. Jesus himself told us not to worry about these things- God will provide for us. Note: Another practical step we can take to stop fear is prayer. We need to be intentional about prayer- how we prayer, when we pray, the topic of our prayer. There is power in prayer. God hears us. He is able to provide. Talking with the Lord is a sure way to eliminate fear and find peace. Note: This does not necessarily exactly explain the chapter, but this is what an attitude overflowing out of dependence on God (instead of too much independence) looks like. Independence is a good thing in many ways- we should all learn to work hard and take care of ourselves, not being a burden to those around us. However, we need to have the humility to rely on God, so that we can give when we are called, not just when everything lines up or makes sense. Hewitt and Moline sum up the chapter well with this quote. We, as the body of Christ, need to focus on interdependence. This is not to say that we should not take care of ourselves or work hard, but that we are a body and we need to rely on one another. This interdependence builds the Kingdom of God! Note – We have been raised with a mindset to hold on to “our” stuff because we never know when we might need it. But didn’t Jesus tell us to be like the birds? To not worry, or be anxious because God will provide? The birds own nothing but they still contribute beauty to everything around them. Don’t we want to be able to say that we contributed beauty to the world around us? Note – Generosity is about love and honor. That is why Jesus tells us to be cheerful givers and not to give out of guilt of mere compliance. Generosity is our opportunity to not just honor God and show that we love Him, but to honor those to whom we are giving. To provide them with the food they need, the clothes they lack, or to pay they bill that they aren’t able. Generosity is our opportunity to love other people. Note – As is the problem with sin, we take the beautiful things God gives us and we twist them. We worship the creatED things rather than the CreatOR (Romans 1:25) and because of that contentment is hard to find. The consumerism, materialism, discontentedness, and envy is nothing new to our time or our country – it is a sad truth that has been rampant throughout history. A truth immortalized by Solomon, the wisest, wealthiest, most powerful King, in Ecclesiastes. Note – We’re not alone is our struggle with materialism. That’s not an excuse to fall into it, but it is an encouragement to keep fighting for contentedness and surrender. We can learn from the stories of struggle of those around us and of Solomon himself. Note – The Bible speaks to the idea of worry and peace often. In Philippians, Paul teaches extensively about not being anxious or worrying but to use prayer to ask for God to give us His peace. He encourages us to take our mind off our worries and reminds us that God is with us and will help see us through every situation. He’s trying to remind us that our peace doesn’t come from our stuff or our circumstances, but from our Creator. Note – Planning is a good way to help prevent the “need” for worrying. By planning, we know what we have, where we need to spend it, and where we get to spend it. Taking care of our basic needs and our bills is important and our paychecks are one way that God provides for those needs, but beyond that we are called to be generous with our money. Generosity produces contentment, trust, joy, and the blessing knowing that we are using our money to serve God and His people. Note – The chapter quotes a story about a greyhound dog that quit racing even though he was winning. Explaining himself, the greyhound said that he realized that the rabbit he was chasing wasn’t real. This is just like what Solomon talks about in Ecclesiastes: that its all meaningless, a chasing after the wind. Note – Our culture creates of made up crisis of never having “enough” and always needing “a little more.” Contentment is the opposite of that. Being content is knowing that you are enough, that God is enough, and that you have more than enough. Our culture – and our country – does not breed contentment, but perpetual dissatisfaction. But practicing gratitude can help us conquer dissatisfaction. Note – God’s calling on our life isn’t always going to be as dramatic as how Noah or Abraham were called. God’s call to us may be ordinary. We might have to pick up and leave the country, we might have to change jobs, or we might just be challenged to do our job with a new motivation and outlook. We have to be willing to listen to God in the little moments and to take all the opportunities we have to try new things. Note – Scheduling our time helps us to manage our time and our relationships. It helps guarantee that all of our priorities get met and allows us to provide a respectable excuse to our friends and family when we aren’t able to do certain things. This doesn’t eliminate any room for spontaneity, but it makes sure that what is important to us gets accomplished. Note – In the story of Jesus healing the paralytic, Jesus asks the man if he really wants to be healed. The man’s answer was “yes, of course” but what kind of fears or doubts do you think he was wrestling with if Jesus felt the need to ask that question? The fear of the unknown, of change, of believing that there is something better and greater out there than we have ever known before, can be crippling. What’s holding us back from trusting God so fully, from accepting his gifts so readily, that he doesn’t have to ask us if we’re sure? Note – Jesus wants us to be carefree, without worry, without anxiousness. He’s not telling us to shrink the responsibilities we have or to not make plans and preparations for out lives, but simply that God is ultimately in control – and because of that, we are free.